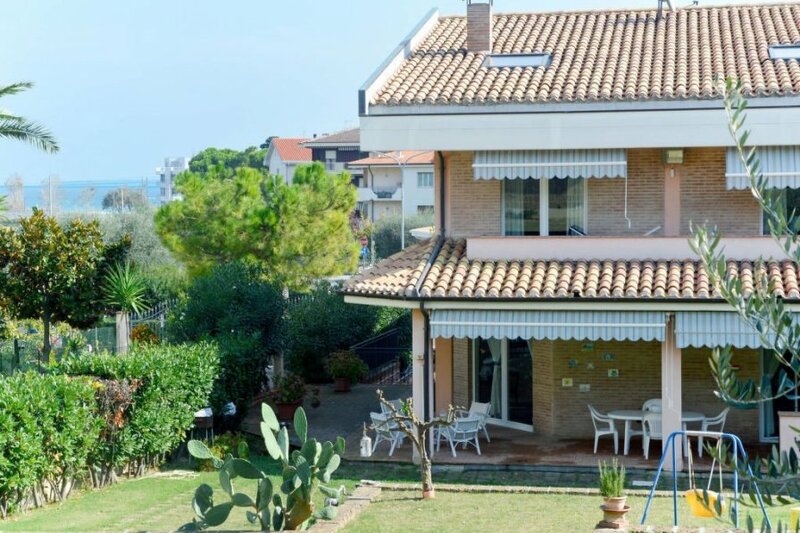 This 4 bedroom villa is located in Pineto and sleeps 9 people. It has WiFi and barbeque facilities. The villa is within walking distance of a beach. Semi-detached house, 8 - 9 people, 6 room/s, 4 bedroom/s, 3 bathroom/s, approximately 330 m², 4 floor/s. Owner lives supplementary flat in the main house. Furnishing: good, pleasant, tasteful, friendly, tiled floor, parquet floor. € 20 per person and stay (depending on occupancy). Electricity according to consumption approximately € 0.30/​kWh. Gas according to consumption approximately € 1.30/​cubic meter. Holiday resort tax. Linen/towels must be brought along. Bed linen available on loan, € 10 per person/​change (on order). Towels available on loan, € 5 per person/​change (on order). Deposit € 500 (in cash). Extra deposit € 1000 (groups, credit card). Extra bed single bed, 2x available, € 12 per person/​day (on order). Cot free of charge (on order). Pet (small pet only; on request). Situation: suburbian area, sea view. Estate (private use): approximately 1000 m², closed plot (fence, hedge). Outdoor facilities(private use): terrace (roofed), balcony, balcony, roof terrace, furnishing provided, transportable barbecue. Sports facilities/ leisure time: private use (free of charge): billiards (available during the whole season). Private use (free of charge): children's playing equipment. The agent describes this villa as a family friendly holiday rental ideal for the summer holidays. It is also good value for money. This villa is located in Pineto. The nearest airport is only 30km away. It is set in a very convenient location, just 0 metres away from a beach and only 1km away from the city center. The villa is suitable for family friendly summer holidays; it is also suitable for elderly guests.